The hardest part about heading to Coyote Gulch? The drive down Hole in the Rock Road out of Escalante. 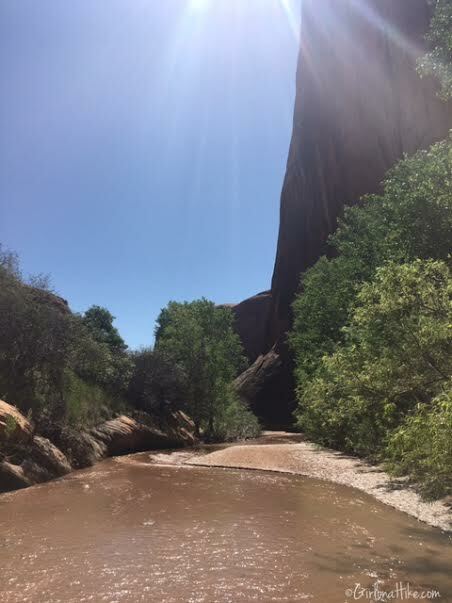 A small compact car can make it, as did my Sonata, but even though its only 40 miles to the Coyote Gulch Short Cut trailhead, it took my car two and a half hours to arrive. This is because Hole in the Rock Road is heavily used, which creates a washboard road, and forces small cars to drive 15-20 MPH. A few of my friends drove a 4x4 car down, and it only took them about 45 minutes down the road to the trailhead. Keep in mind that during or after a rainstorm, Hole in the Rock Road and the trailhead turn off may be impassable. 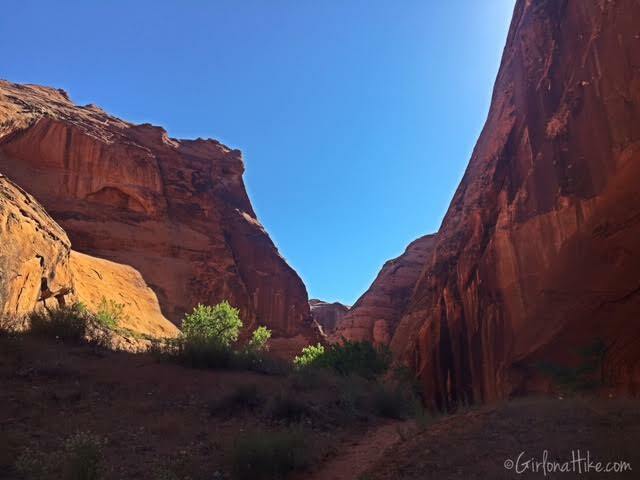 There are two popular trailheads for hiking into Coyote Gulch - Hurricane Wash and Crack in the Wall (off Fortymile Ridge Road). 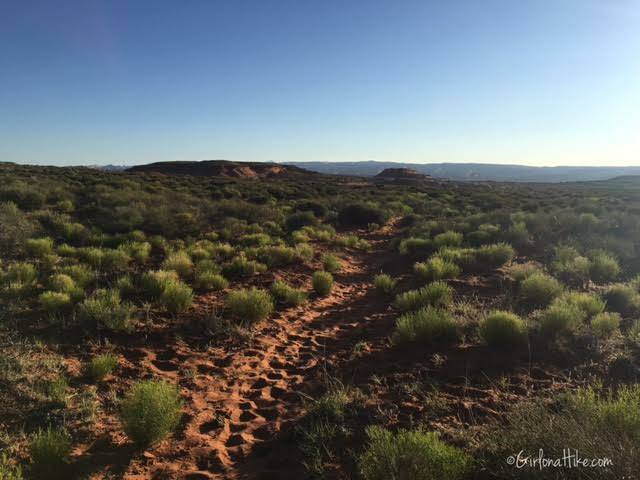 Starting from Hurricane Wash will require an 8 mile trek in with no water and in a sandy trail. Crack in the Wall is another good route, but requires people (and their packs) to fit through an 18 inch wide "crack", before reaching the main trail. There is a lesser know, and much shorter route called either the Short Cut or Water Tank route. 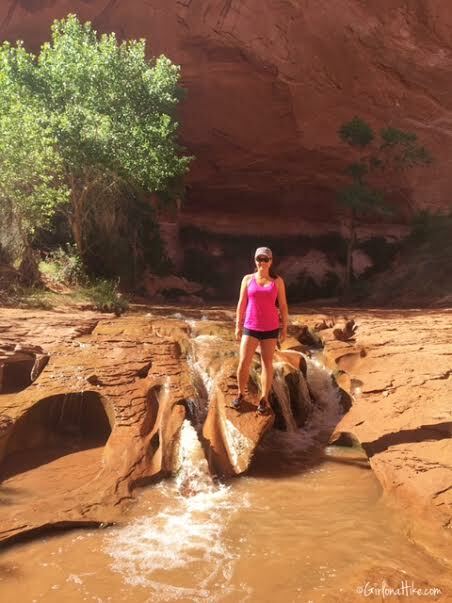 We decided to take this trail since it's only 2 miles in to the bottom of Coyote Gulch. 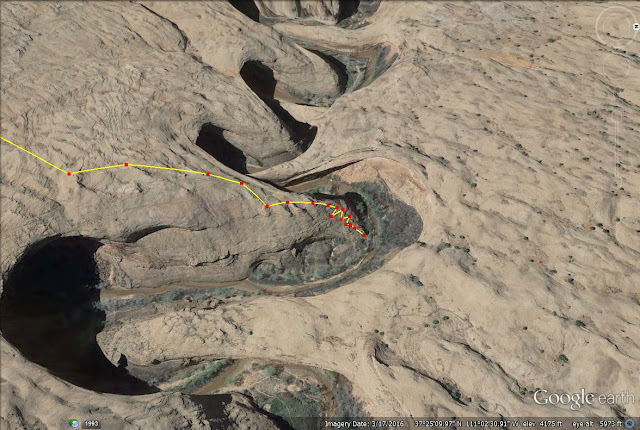 However, this route requires small scrambling down a 100 ft slickrock face. Only sure-footed hikers and those not afraid of heights should attempt this route. 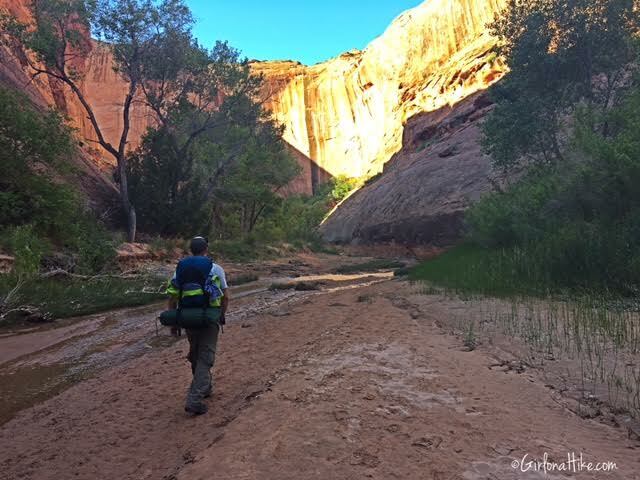 A 150 ft rope will be very handy for helping hikers and their packs up this route upon exit. Do not count on a rope being available for you! Since we started and ended at the Short Cut/Water Tank route, all descriptions will be based off that trail. How do I get a permit, and how much does it cost? As of 2016, the permit is free and can be attained at the Short Cut TH, Crack in the Wall TH, or Hurricane Wash TH. Can I bring my dog? 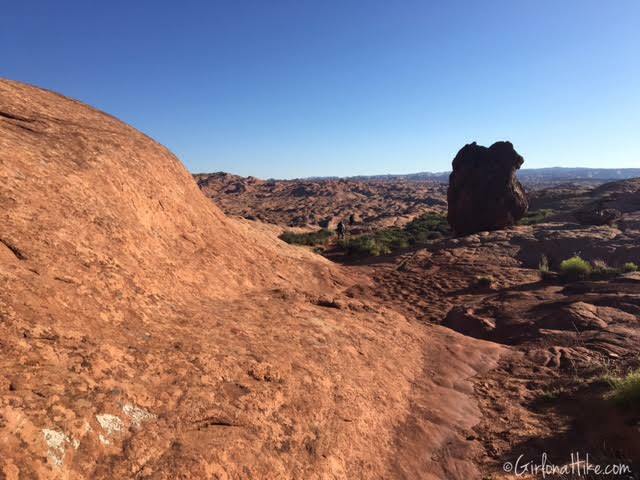 No, dogs are banned from all Glen Canyon Recreation Areas. Is this a good trail for my kids? Yes! I saw several families with kids ranging from toddlers to teenagers. How many nights do you recommend staying in the canyon? One night is doable, but I thought two nights was perfect. It gave my group a chance to have some rest time, time to explore, hang out with each other, but also to see all the major sites. Where can I camp? Anywhere in the canyon. 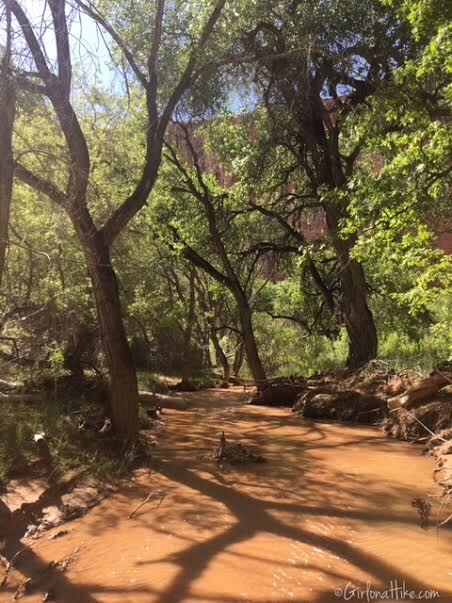 There are campsites all along the stream. 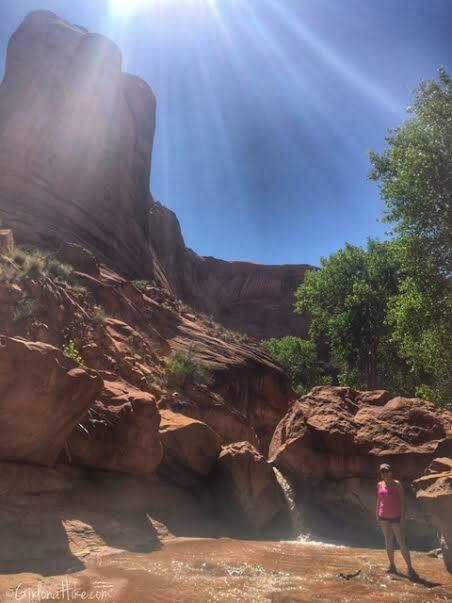 Fires are not permitted in Coyote Gulch. 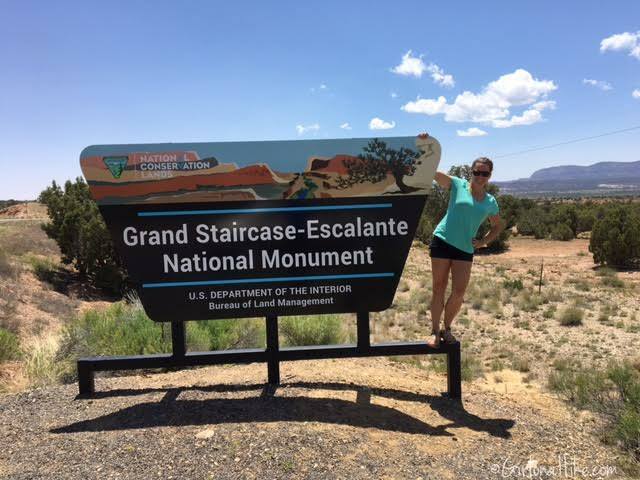 From Escalante, UT head east on HWY 12 for 5 miles. Turn right onto Hole in the Rock Road. Immediately reset your odometer to 0. Cross several cattle guards. 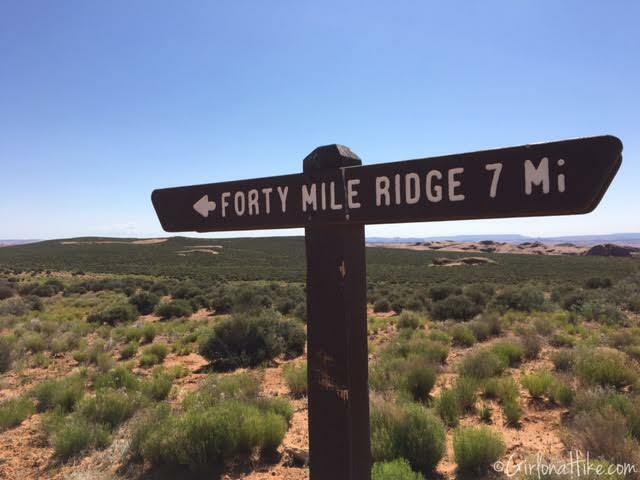 At 36.0 miles, turn left onto the signed Fortymile Ridge Road. At 39.8 miles veer left up to the water tank. Drive another 0.2 miles to reach the TH at the Water Tank (see maps at end of post). We drove down from SLC after work, and arrived at the TH around midnight. Quickly set up camp, and got about 5 hours of sleep. 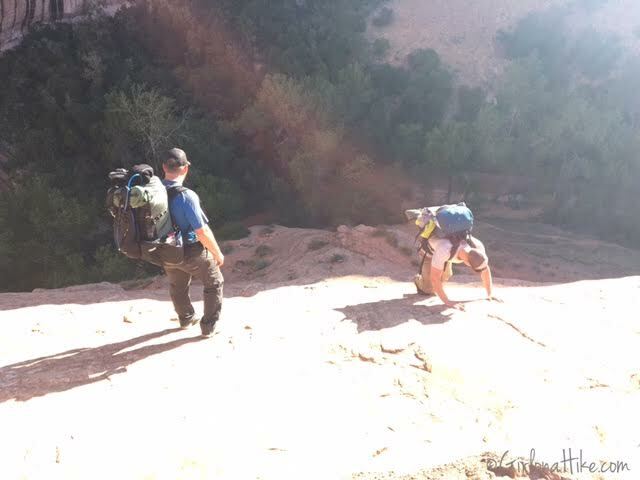 We woke up at 5:30am Friday morning, and got out gear together, and started hiking at 7am. 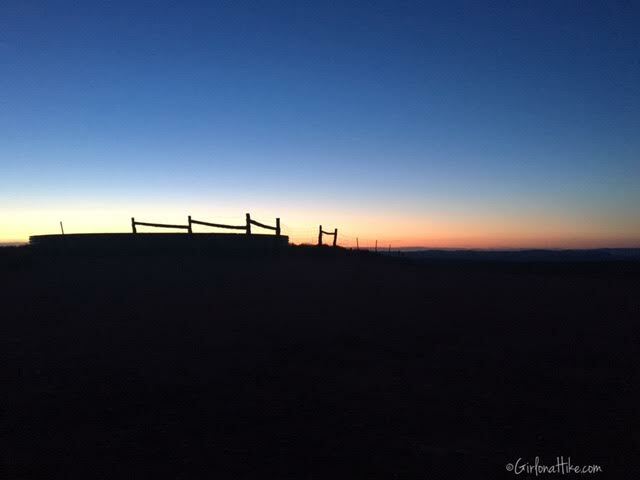 This was taken just before sunrise on the west side of the water tank, in the parking lot. There is actually water in this tank, I think for the cattle in the area. 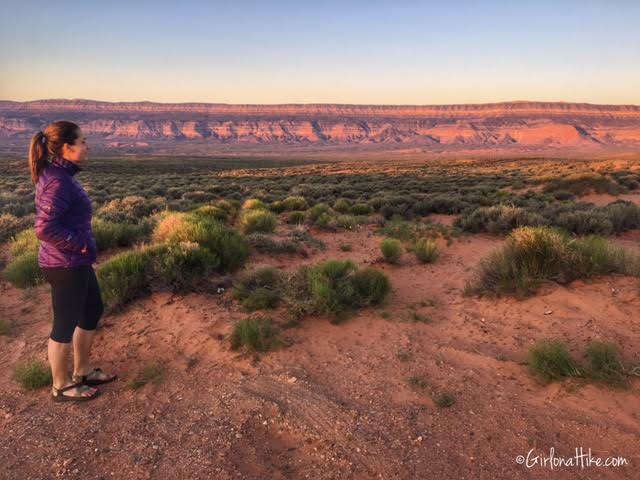 Just before getting on the trail, the early morning light was too good to pass for a photo op! Got my pack ready to go! 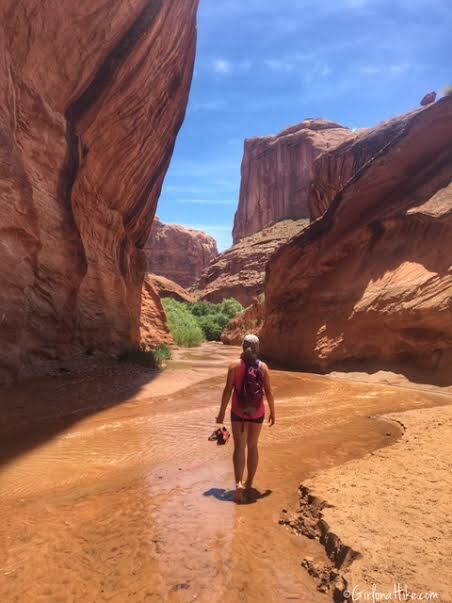 Tip: Bring water shoes that don't allow rocks or sand to get inside the shoe. You will be hiking in water most of the time. For a list of what I usually bring, click here. 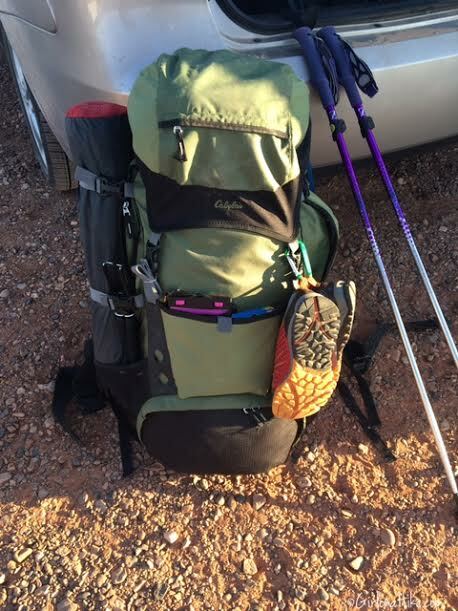 I fully upgraded my pack and tent in 2018! 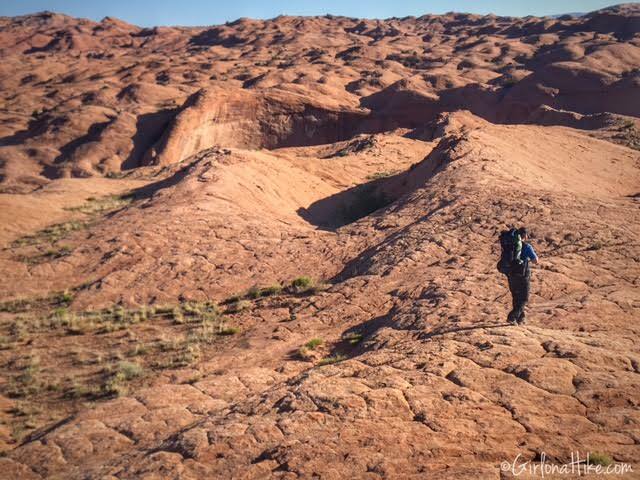 Check out my new Waymark Gear Co ultralight pack here. Starting out the trail cut through this sage field for about 3/4 mile. 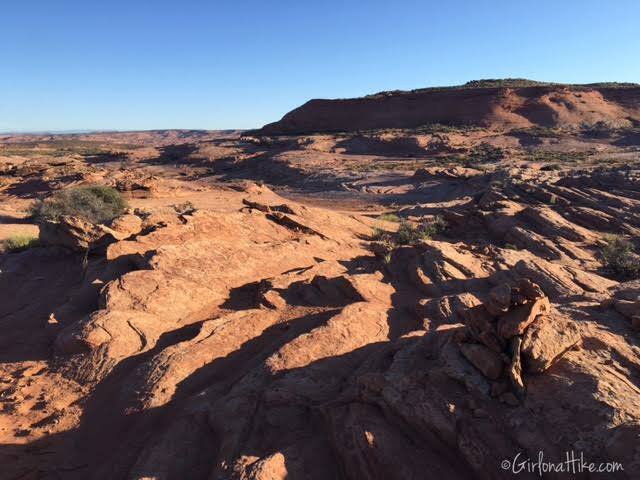 Once you get to the slickrock, follow the cairns. You will be hiking to the west of that hill. If you get yourself on the east side, you are going the wrong way. 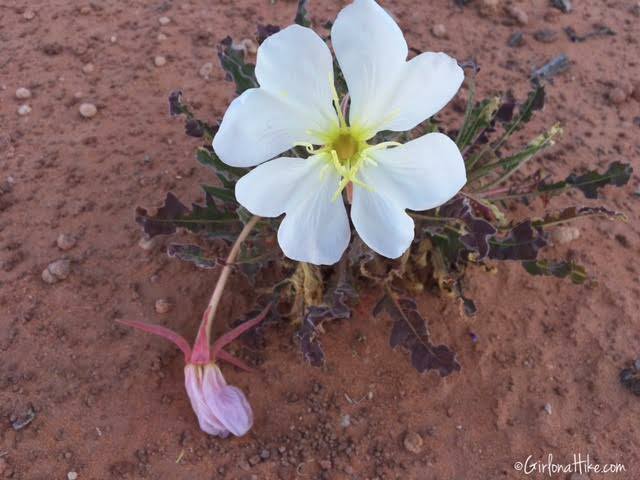 Several desert flowers were in bloom! 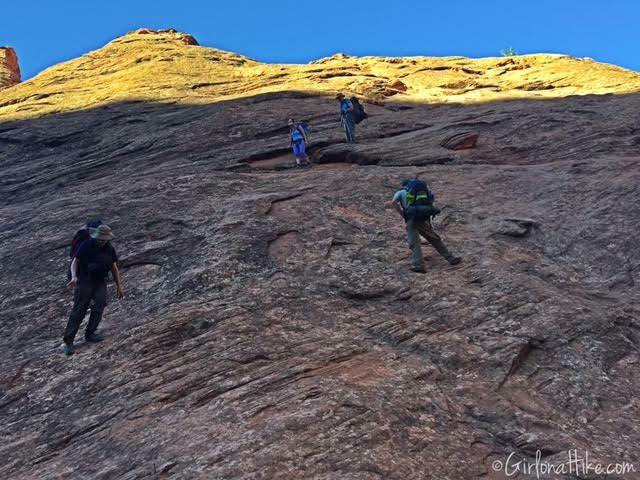 CJ leads the way over the slickrock. The cairns should take you past this Lone Rock (rock to the right), that looks out of place by looking at its geology. It almost looks like an ancient volcano rock. 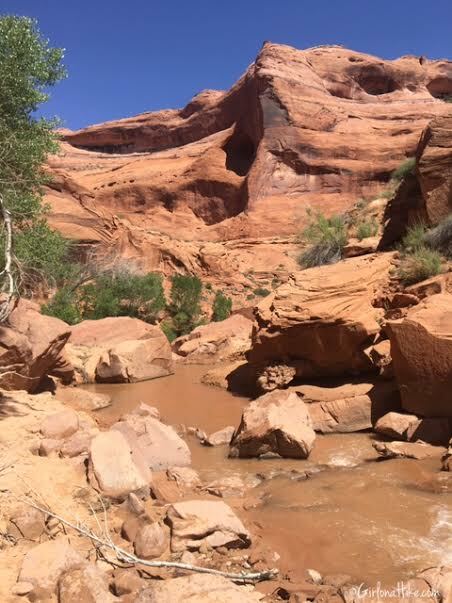 At about 1.8 miles you will start to see that there is a canyon ahead of you - this is the canyon you will hike down into. 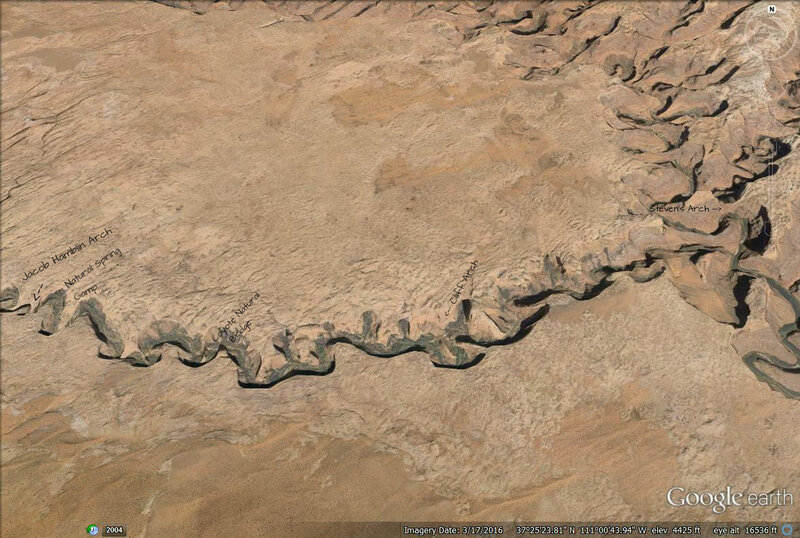 What you want to look for, is the large white "U" or wing-shaped figure across the canyon wall. This is where the short cut route leads you down into the canyon. It's the only spot in the canyon, that is doable for hiking down. Just to the left is Jacob Hamblin arch - but you can't quite tell until you are further down this hill. Working our way down, the guys led the way, and sometimes had to hike down facing the slickrock. 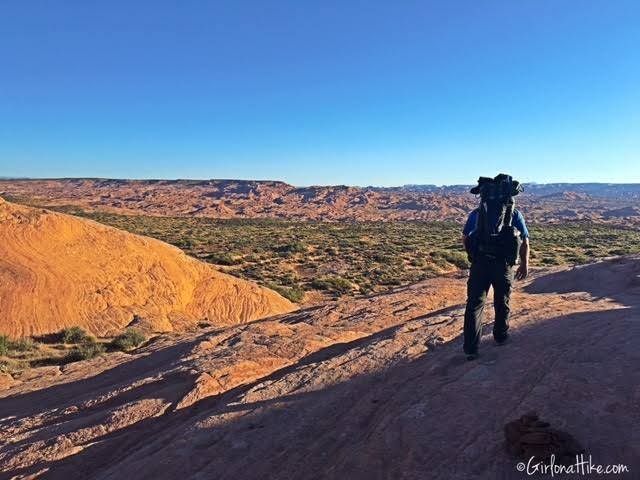 At times, we had to drop our packs down to the next person because the weight of our packs was throwing us off balance. Waiting for our group to get down the steep section. The last piece of the steep section requires a little scrambling. With someone at the base of this part, you can get some help down easier. Finally down in the canyon!!! It took us 1 hour 15 minutes to reach this point. 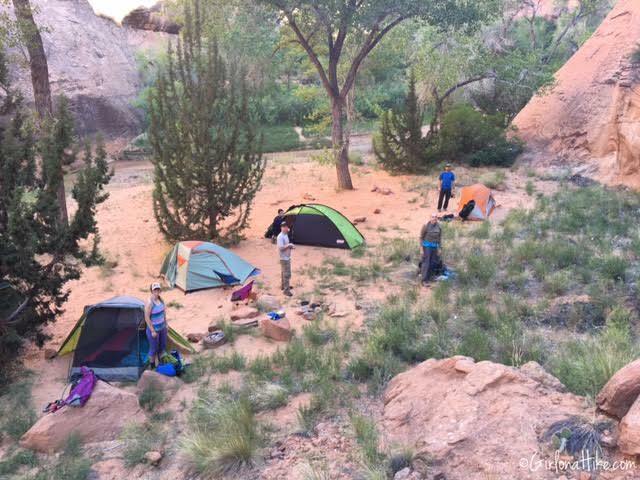 We literally picked the first large campsite we found, so we could fit all 12 people in one site. Our campsite was just across the stream and to the left. Half of our group sets up camp. The other half of our group arrived an hour later. We were able to get this campsite at around 8:30am. 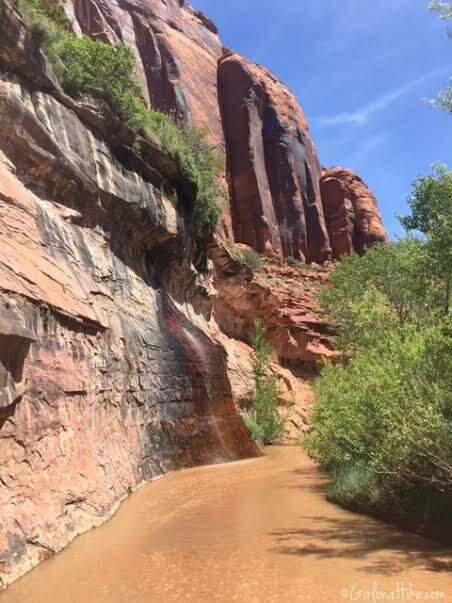 Once you get down the steep hill, if you head left towards Jacob Hamblin arch, there is a natural spring on the right hand side of the canyon, that is perfect for getting more water to filter. There is less silt and dirt, which makes it faster to filter. 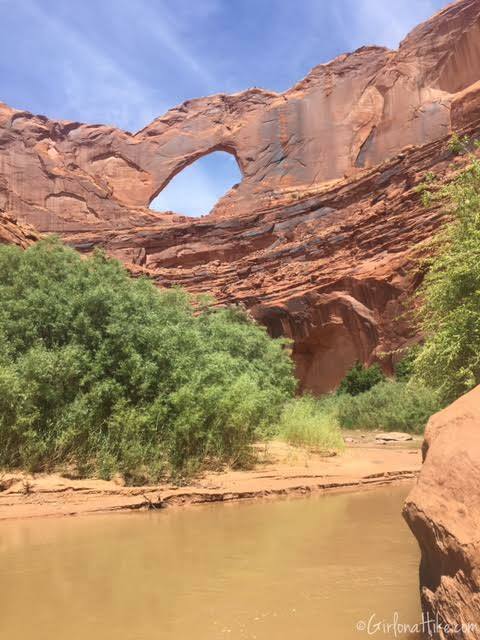 After setting up camp, we hiked around the bend to Jacob Hamblin Arch (the water spring is on the right side of this photo). 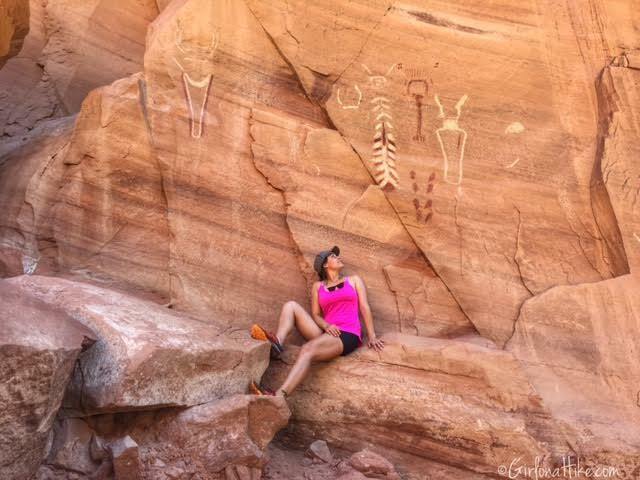 The canyon walls were so big! 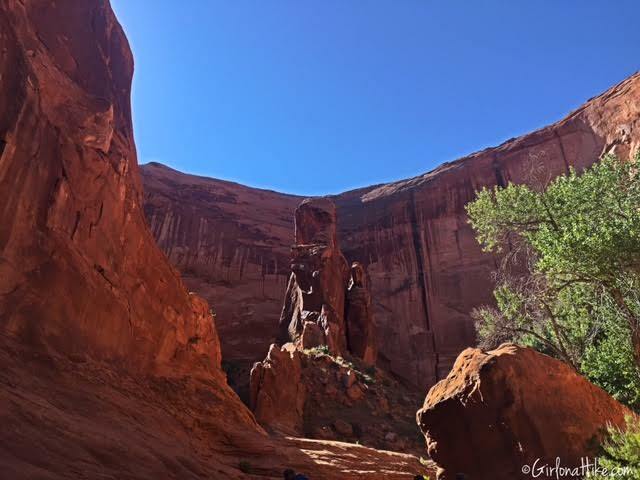 On the opposite side of Jacob Hamblin Arch, with the morning light coming through the arch. 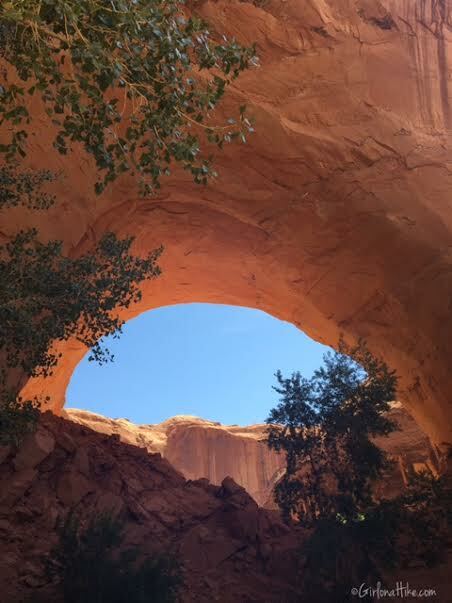 Another view of Jacob Hamblin Arch, with the alcove above us. We turned around at this tree (roughly 2 miles up stream from camp). We then made our way back towards camp. My friends walking ahead of me show how big the canyon is. 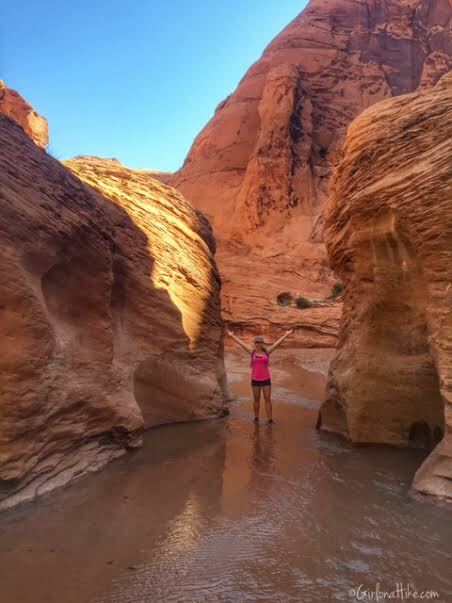 Once the sun rose above the canyon walls, it warmed up quickly and the water started to feel very refreshing. 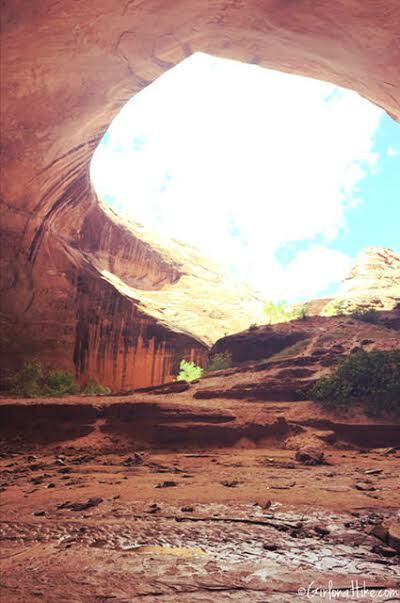 Under one of the big alcoves in Coyote Gulch. On Day 2 (Saturday) we started hiking at 9am, since we knew we had a big day ahead of us. 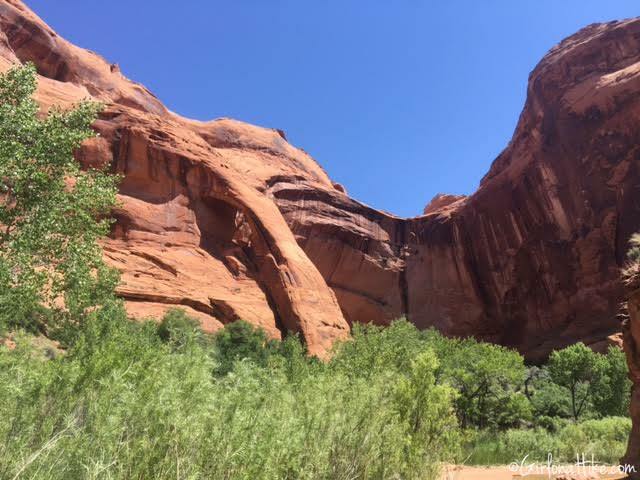 Our goal was to hike to the confluence of the Escalante River, and over to Steven's Arch. Around every corner was something even prettier! 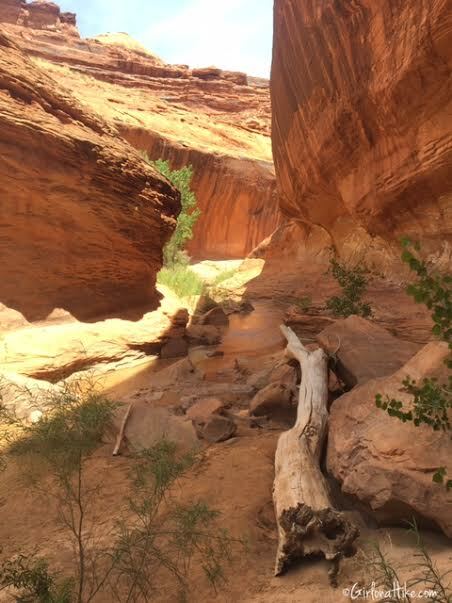 Cutting through this small slot canyon. 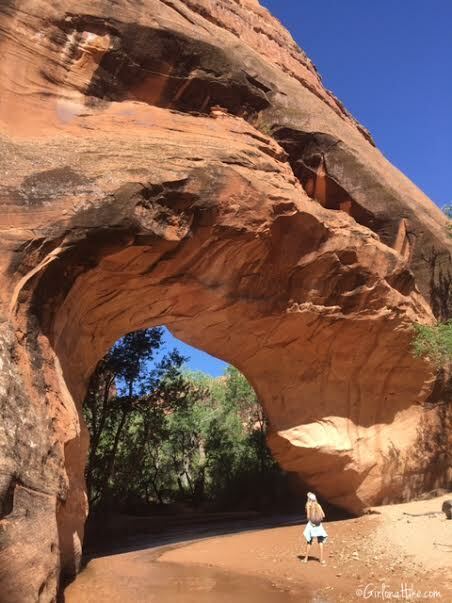 My friend Margarite stands under Coyote Natural Bridge. Part of the trail cut through very shaded sections, and it was a relief from the 75F heat. Although the creek looks deep, it was never more than ankle deep. Coyote Gulch has several secret areas along the canyon, if you know where to look. One are these large petroglphys. I would like to keep some things hidden, and not open to vandalism, so I'm not telling where they are located. 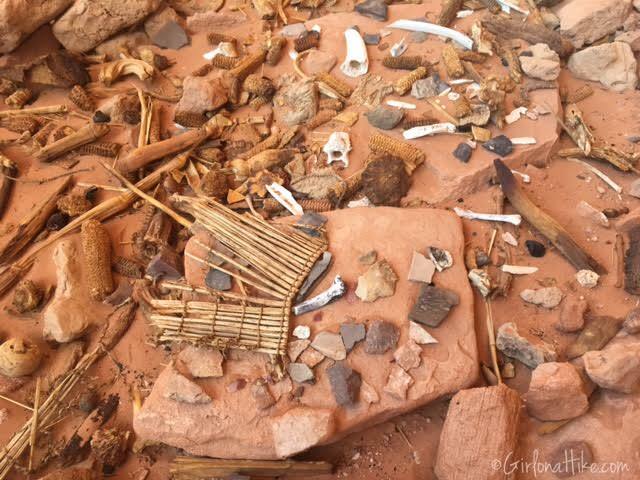 Artifacts found in Coyote Gulch. Another secret spot! About halfway (3 miles from our camp) there is a section that starts to get rocky. This is where you will start to see waterfalls, cascades, and around this bend, Cliff Arch. We reached Cliff Arch! Our first group photo with everyone there, using my trusty mini tripod. 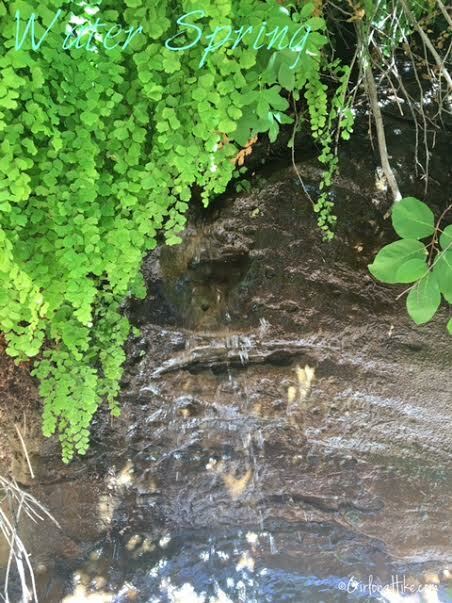 Mini waterfall near Cliff Arch. 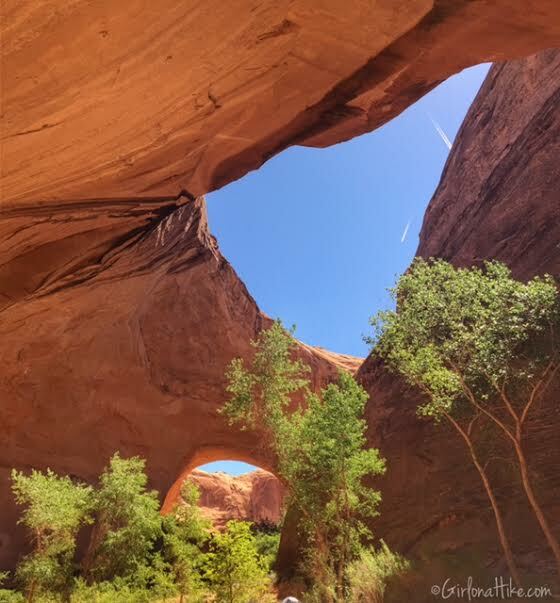 Another shot of Cliff Arch. 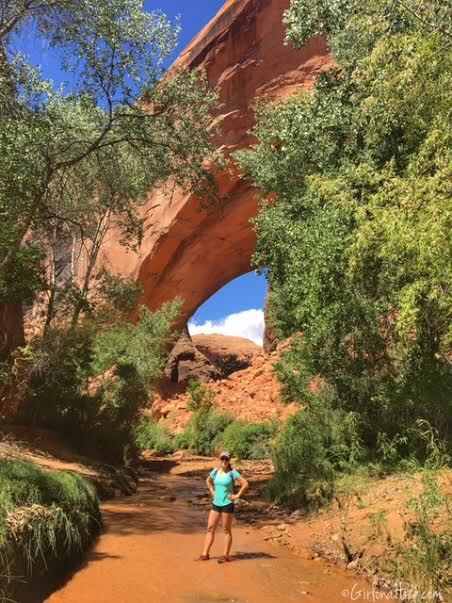 The photo makes this arch look small, but it is actually really big! 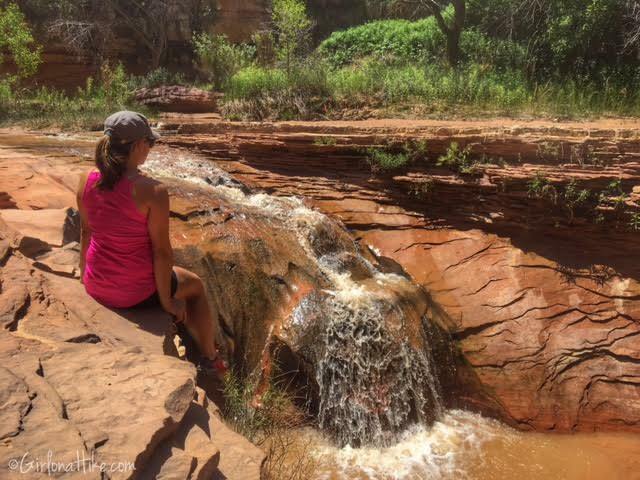 Waterfall #3 - taking it all in! 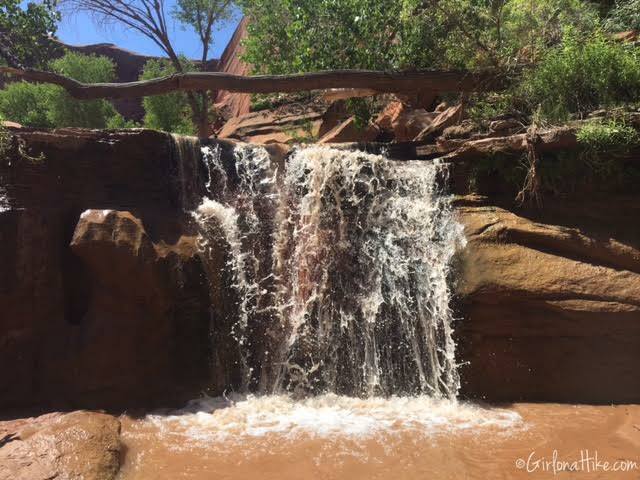 This is another natural spring in Coyote Gulch, which also doubles as a small waterfall. 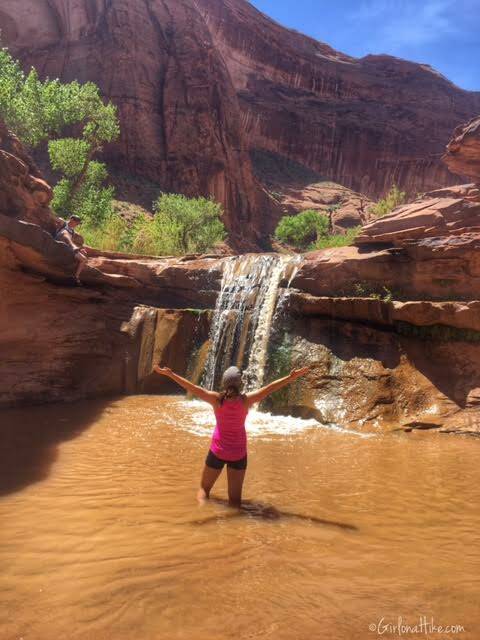 Standing underneath this was one of my favorite moments in the canyon because the cold, clean water felt so refreshing after sweating for hours! This is a good place to refill water on the hike back to camp. Waterfall #5. 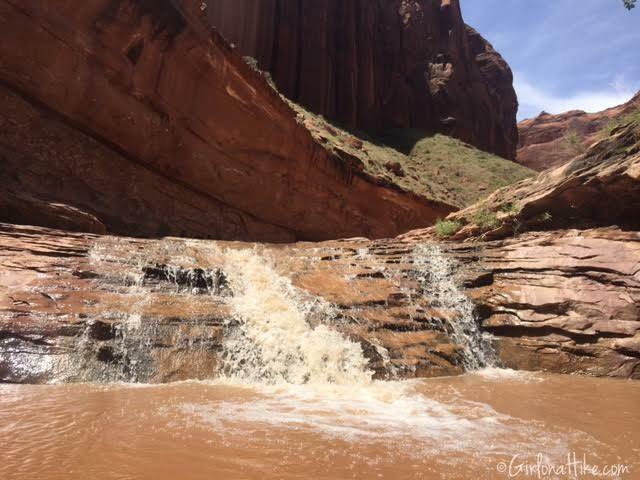 From these falls, you only have about 1.5 miles before reaching the confluence. I really liked this part of the canyon - it just had a different feel that the upper canyon. 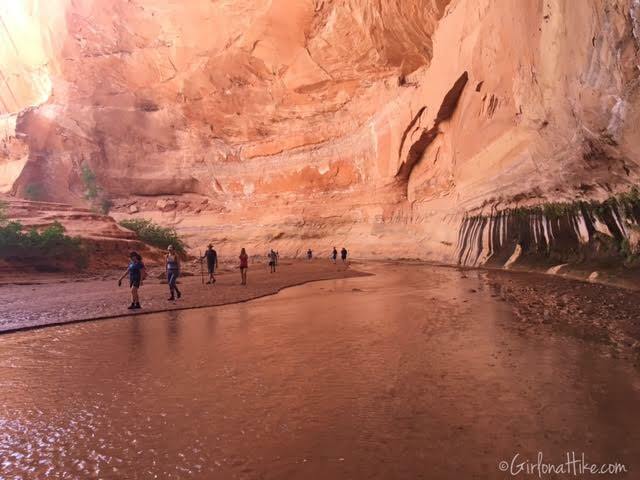 Just before reaching the confluence of the Escalante River, I took my shoes off and walked in the sandy water. It felt so good to walk barefoot! 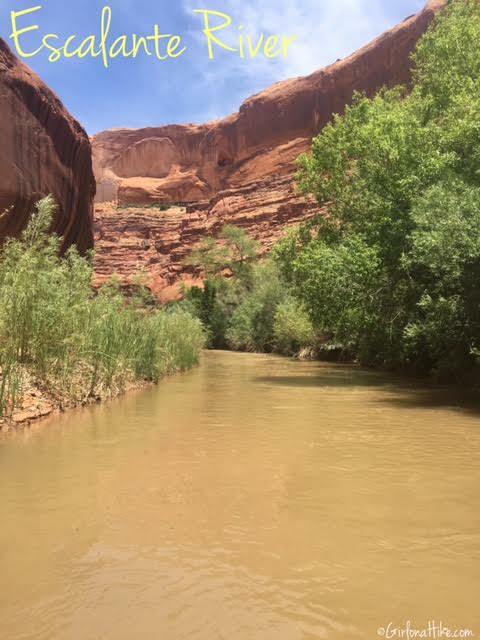 It took us roughly 4.5-5 hours to reach the Escalante River. 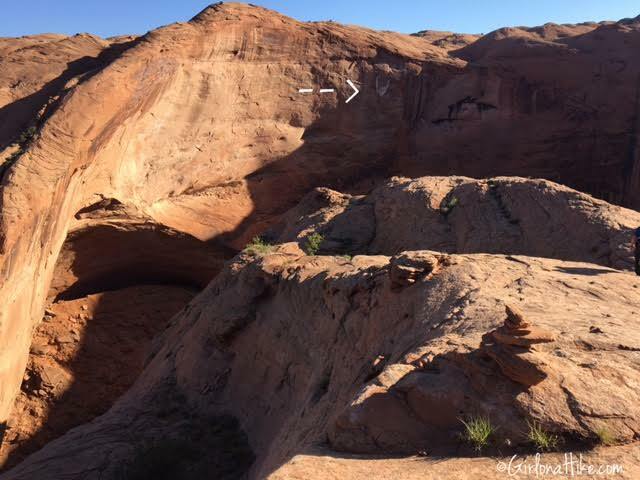 Once you reach it, turn left and hike up stream for about 0.2 miles until you see Steven's Arch. 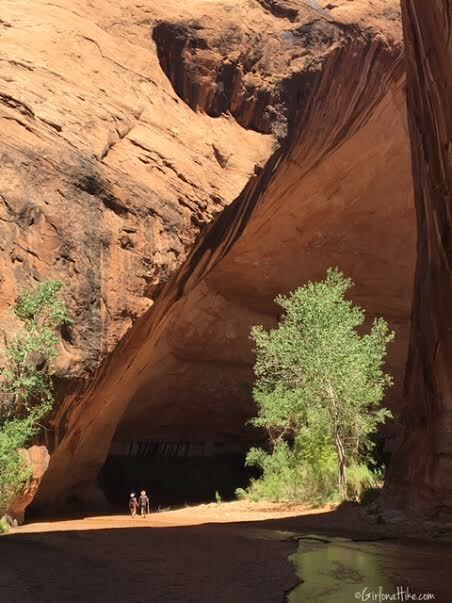 Just around the bend is Steven's Arch! Half of our group decided to hike up to to, and stand underneath. There is a faint trail that leads up to it. 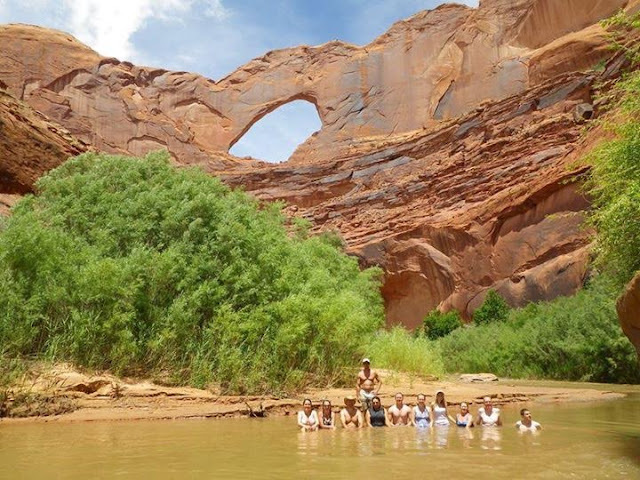 We all brought our swimsuits along and swam in the river for about an hour. After swimming and having lunch, we returned the way we came, this time hiking at a faster pace and taking less photos. It only took us 3 hours to get back to camp. 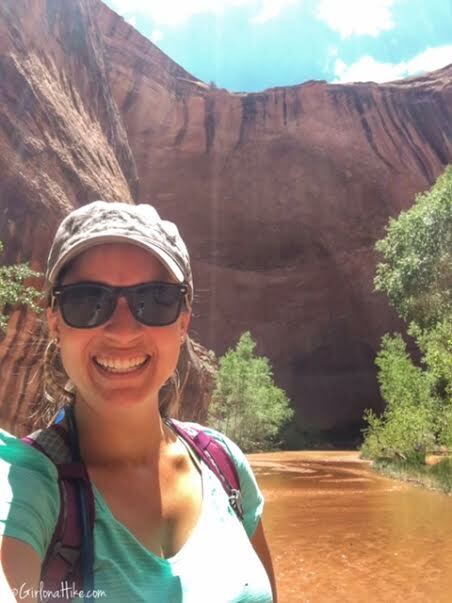 Be sure to bring plenty of food, water, and sunblock for this all day hike. 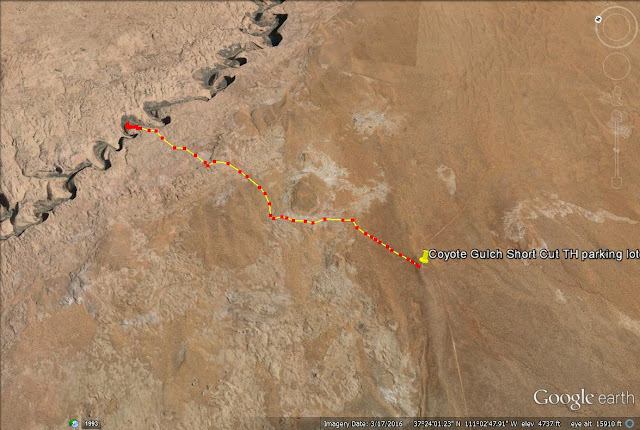 This is the Short Cut/Water Tank trail map looking NE. This trail map shows a close up of how to get down the steep section. Overview of major sites, marked with an arrow and name. 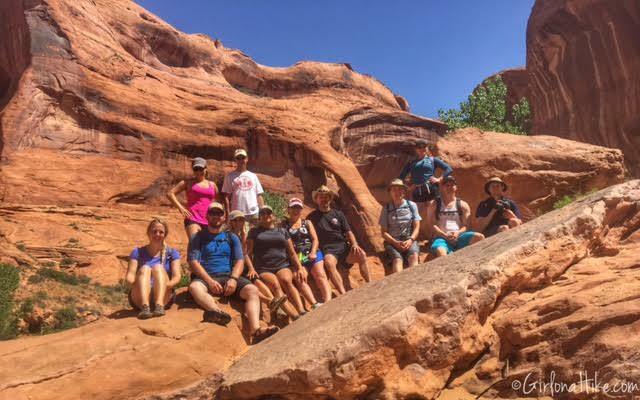 Be sure to check out this time lapse video of our trip to Coyote Gulch! 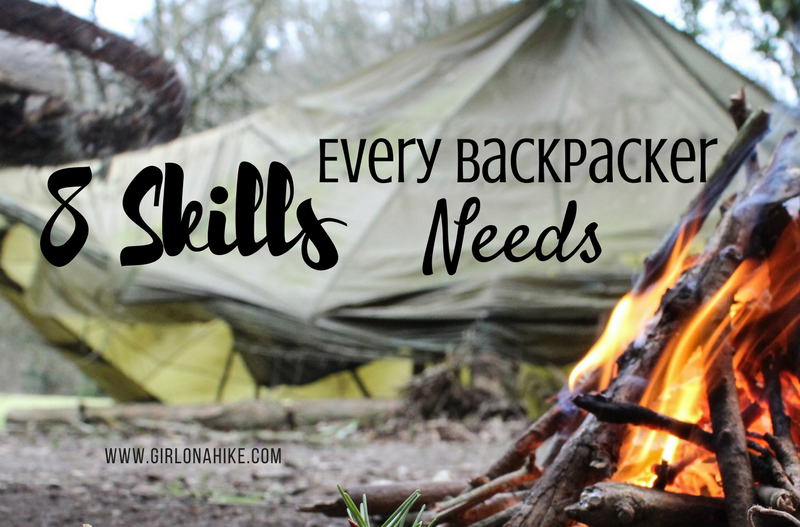 Be sure to have these 8 Skills Every Backpacker Needs! 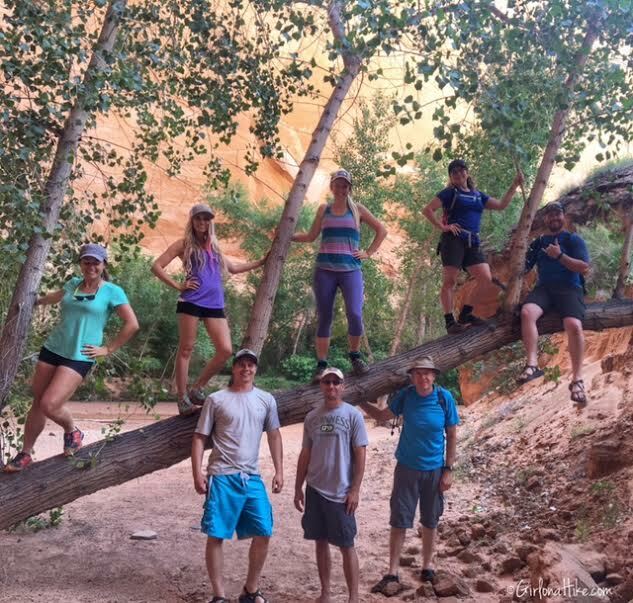 Have questions about backpacking here? Post your comments below! That was great, . . I felt like I was there. Loved the pictures. What a great hike! I love all the arches and falls. Hiking in this depth of water is fun. Looks like your group had a fantastic holiday! Surprised you all didn't go up to take a swim in the Black Lagoon. Anyways, a few details you should have probably included are that 1) Maximum group size is 12, which your group maxed out. I've seen other group photos that have well over 12 in them and that's not cool because when people don't follow rules like that, more rules get created, permit fees get applied, etc. and I don't like seeing fees and additional regulations put into place that wouldn't be there if people were more respectful. 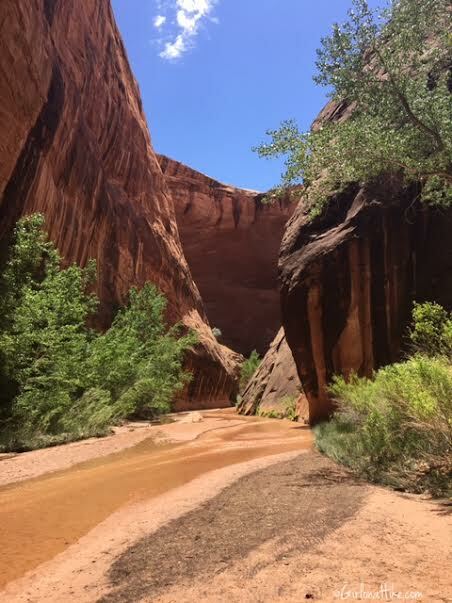 Not only that, but in canyons like that, noise travels easily, and the larger the group, the more noise there will likely be from that group, and that can disturb the experience of others trying to enjoy the natural ambient sounds of the canyon. So, not only can large groups more physical impact on an environment, but an audible impact as well. 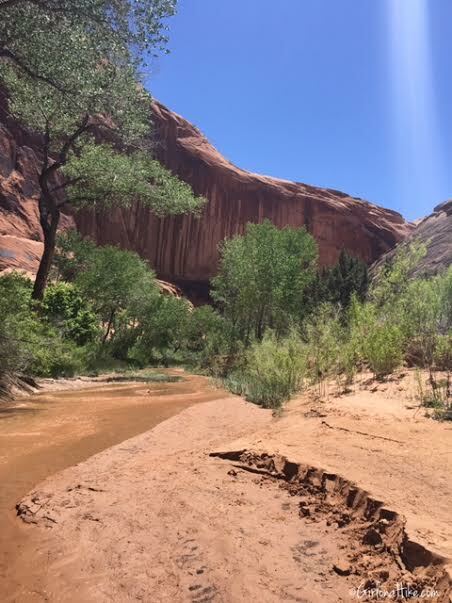 2) As noted here, https://www.nps.gov/glca/learn/news/new-waste-disposal-requirements-for-coyote-gulch-visitors.htm, and in many other trail guides that have since been posted online by others for this place, NPS requires all to pack out their own solid waste with appropriate WAG Bags or other similar product and then disposed of properly. Even back in 2009, when I was down there and these regulations weren't in effect yet, there was loads of TP, feminine hygiene products, and other unsanitary items that people had left in the bushes or buried very shallowly and close to the waters edge. It was nasty and made me cringe to think what else was flowing in that water. I acknowledge though, most probably still don't follow this new recent regulation because they're either ignorant of it and/or they don't care because they know it is hard for the NPS to enforce. I wish it were something that could be effectively enforced, because that alone may just thin out some of the crowds. Lastly, there was some discussion not long ago about the prospects of paving the entire HIR road. I'll just say I'm glad they didn't and hope they don't ever do it. That would really amplify the crowds down there. That all said, it looks like you had a good time down there. I'd love to visit it again sometime, but probably not until I get to experience a lot of other places on my own list first. Yes, there are two other routes - Hurricane Wash/Red Well TH and Crack in the Wall. What is the temperature day and night mid April? Is it easy to get lost while doing this trip? Thanks for the reply! My sister and I are planning on doing this trip in a few weeks. My only other concern is getting back up that 100ft in the beginning. My girlfriend and I are planning to do this in about 2 weeks, weather depending. Just wondering if you know if we will be able to get permits this time of the year? Everywhere I have read says optimal season begins in March, but haven't found anything about hiking this canyon in February. Thoughts? Hoping there will be water flowing. We are aware that it will be below freezing at night. Thanks! Best post I have seen to date. Shows where and time to most every spot. Great job. I am headed there for four days same rought in early May. Only place I didn't see was hidden lagoon which I have to still find. Thanks for all the info. Thank you!!! And I hope you have a great time! May is a perfect time to go. Thank you for such a great, detailed account! Trying to go this May on the same trip. I'm a pretty avid hiker. My friend (who hasn't committed to the trip) isn't as in shape, so I haven't decided yet which route to take. I'm curious about ascending and descending the way you did via JHA. (I've read so many different opinions. )Heights don't bother me. Is it hard to keep your footing with the backpack on? Also, did you have a rope there in place? (Like from a a person who left it there...or did you put one down?) if not, would it have been easier with a rope? My only concern is having the pack on and trying to maintain footing? How hard was it to ascend?... and that being said, what was harder.. Thanks! You'll love hiking here in May - perfect temps usually. That route is great for anyone. Some of the people who went with me weren't in great shape either and they were able to get down. There was already a rope in place when we went, but I've heard the BLM goes through and cleans that stuff out randomly, so it's probably wise to bring one for your group. I only needed help getting down that last 6-8 foot section, but someone taller can get down easiest first, then help the rest down and hand packs down. The only reason I wouldn't take this route again is because I would want to see something new - but I highly recommend this route overall, especially for a first time. Thanks so much for getting back so quickly! So ... how about when it came to doing the ascent... going back up JHA? Especially with the backpacks on? How was it maneuvering that? Thanks again for your time! We went up and down that same route. 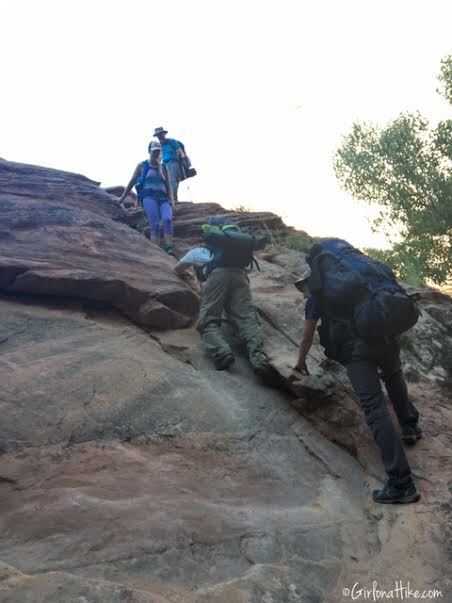 It was actually easier going up because you can climb uphill on all fours, and the weight of the pack actually helps push you into the slickrock.